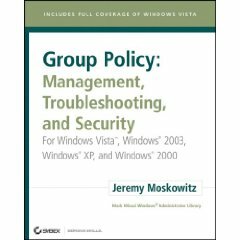 Jeremy Moskowitz: Group Policy: Management, Troubleshooting, and Security: For Windows Vista , Windows 2003, Windows XP, and Windows 2000 (Mark Minasi Windows Administrator Library), 4e, Sybex/Wiley, April 9, 2007, ISBN-13: 978-0470106426. 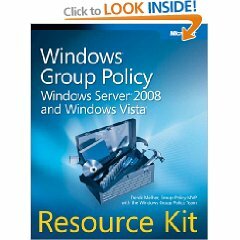 Derek Melber: Windows Group Policy Resource Kit: Windows Server 2008 and Windows Vista, Microsoft Press, March 15, 2008, ISBN-13: 978-0735625143. I had the good fortune to work with Derek on several editions of the Exam Cram titles on Windows XP, and got to know and respect his knowledge and skills in working with all aspects of Microsoft desktop operating systems, including GPOs. His Microsoft Press book is a bit shorter than Moskowitz’s offering, but none the less valuable for its more focused coverage of the subject matter. I find the Moskowitz book to be better when troubleshooting GPO issues or mysteries, but this book to be a better general reference and how-to when it comes to implementing GPOs for enterprise use. Melber certainly hits all the key topics related to GPOs in this book, including automating typical administrative tasks, handling policy enforcement, working with system updates and software installations, dealing with security services and settings, and centralized management and control of GPOs. You’ll also find a CD included with the book that offers some nice utilities and various kinds of GPO planning and design aids. Definitely worth the price of admission ($31.49 at Amazon). Vista admins seeking a good reference book would do well to acquire Melber’s Resource Kit; those looking for a great GPO troubleshooting resource should turn to Moskowitz instead. Me? I have both books, because I need a good reference, and I also appreciate (and use regularly) Moskowitz’s troubleshooting help and his many good examples.